Íñigo Ramírez de Haro » Blog Archive » “Trágala, Trágala, the musical” is back! “Trágala, Trágala, the musical” is back! Trágala, Trágala… is back! I am so pleased to inform you that I am not only still alive, but also my new play is looking better than ever! If you happen to find yourself in Madrid in the following months, do not hesitate to come visit me at the theatre Nuevo Apolo, were Trágala, Trágala, the musical… will be playing starting on November 5! 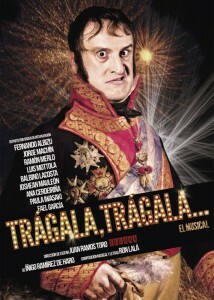 Trágala, Trágala… is the most rebellious, irreverent and hilarious musical in Spain. Do not miss it!!! Dates: Starting on November 5! Upcoming shows: From Wednesday to Friday at 8pm. Saturdays at 5pm and 8pm. Sundays at 6pm. Tickets: 15€ – 35€. Tickets.